We started our travel from Don Bosco School Sta. Mesa to Barangay Pulantubig, Baco, Oriental Mindoro in the wee hours of the morning of October 22. The volunteers had very little or no sleep at all so we tried to take advantage of the travel time to catch some shuteye. After almost two hours of land travel, we reached Batangas Port where we broke our fast by sharing a simple meal of rice, boiled eggs, and hotdogs. By sunrise, we excitedly hopped on a fast craft to Calapan. We reached the pier on or about 8:00 am where we were met by our Italian volunteer, Roberto, Tatay Lito Suzara, and Leng, our youngest volunteer. We immediately headed off to our mangrove planting site so we can reach the area before the tide went up. 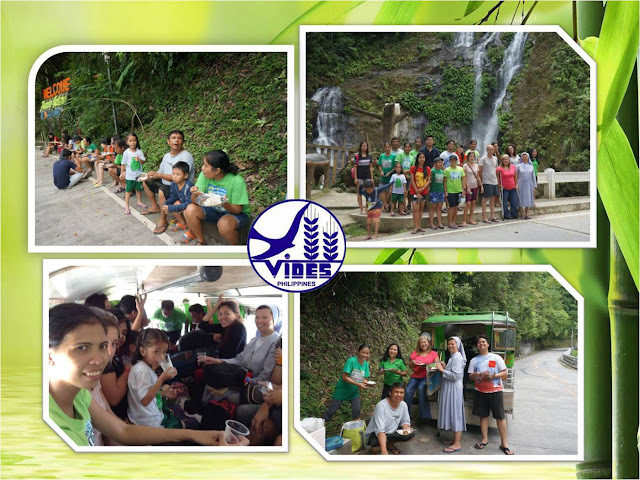 We had to endure a bumpy, muddy ride to get to Barangay Pulantubig. Despite the lack of sleep, the volunteers seemed to have a boundless source of energy as there was endless chatter and a chorus of laughter every now and then. 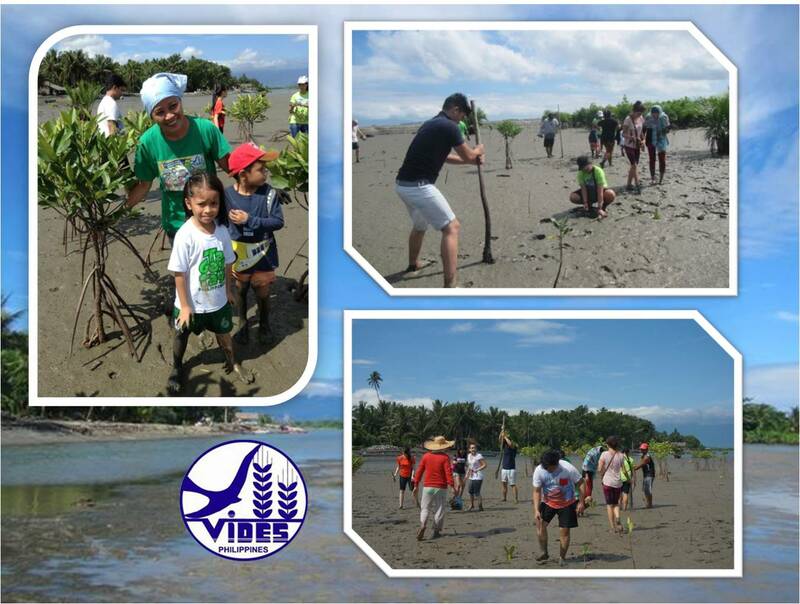 We reached the mangrove planting site at around 9:00 am. From where we parked our vehicle, we walked for about 300 meters, crossed a makeshift bamboo bridge, waded into thigh-deep water (almost waist-deep for vertically challenged volunteers like me! ), and trod through mud. 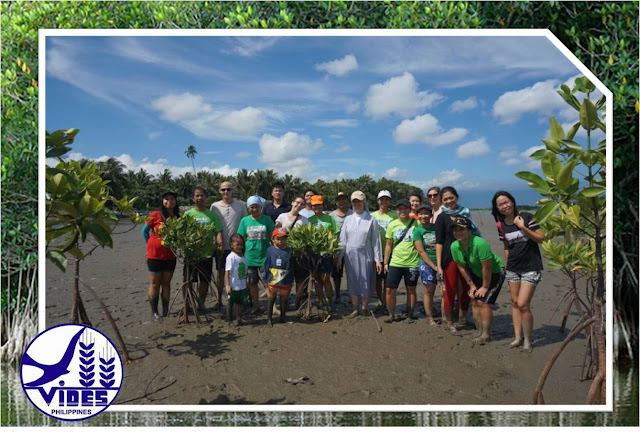 Since it was already scorching hot and we had just about an hour or so before the water went up, we immediately started planting the mangrove propagules. We finished in no time since the volunteers already knew the terrain and the drill. 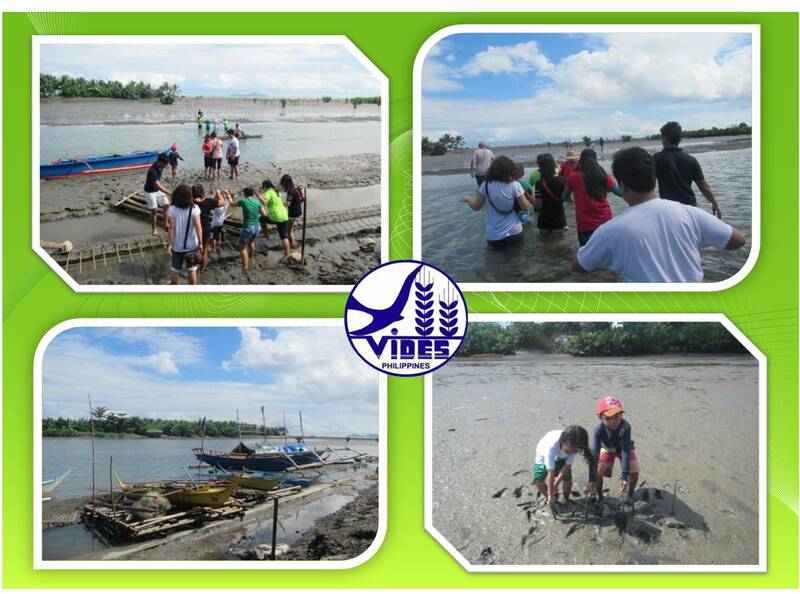 Most of us, even the two kids, Vhon and Leng, had joined previous mangrove planting activities. After planting all the propagules, we took the opportunity to inspect the mangroves previously planted by the volunteers. We were pleased to see that the trees that survived were already taller than some of us. We took souvenir photos and then proceeded to head back to the mainland as the water was already rising. After rinsing the mud off our clothes and legs at the community well where the locals gather to wash their clothes and do their daily cleansing chores, we proceeded to travel to Puerto Galera for some R&R and VIDES bonding time. We passed by the iconic Tamaraw Falls to take obligatory group photos and selfies. Since we were all hungry by the time we reached the place, we decided to just eat our lunch there. We reached Bulabod Beach at around 1:30 pm. We proceeded to the rest house where we were welcomed by Tiya Ester. 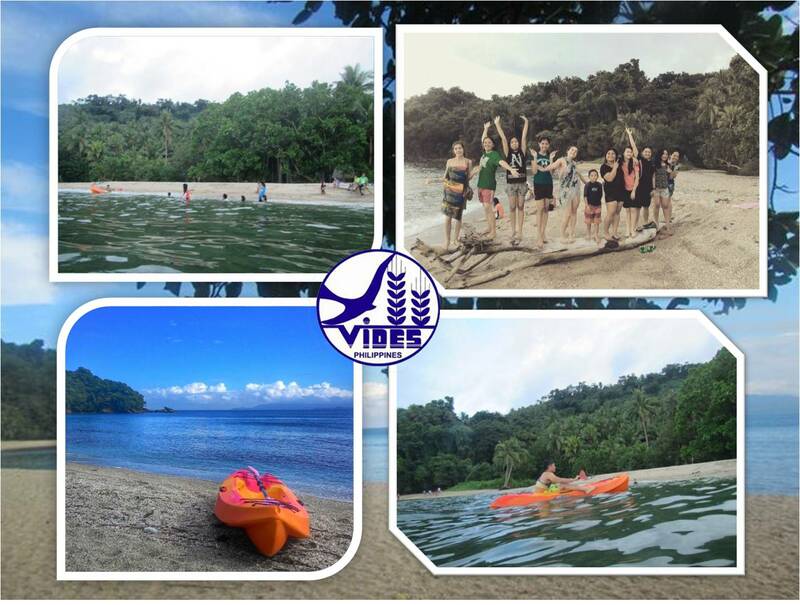 The volunteers took a rest and soon after got their dose of much-needed "vitamin sea". After an entire afternoon of frolicking at the beach, the volunteers helped each other out in cooking supper. Everyone enjoyed the feast of rice, grilled fish, fiddlehead fern cooked in coconut milk, and fresh green salad. Since the volunteers had very little sleep the night before and were tired from travelling, planting mangroves, and swimming, almost everyone retired to bed early. (By early I meant seven in the evening!) We happily headed off to dreamland, lulled to sleep by the sound of crickets and rustling leaves that whispered in the night breeze. We woke up refreshed and recharged the next morning. We started the day with a community prayer led by Sister Jojo Carrasco FMA and a reflection on our vocation as VIDES volunteers. 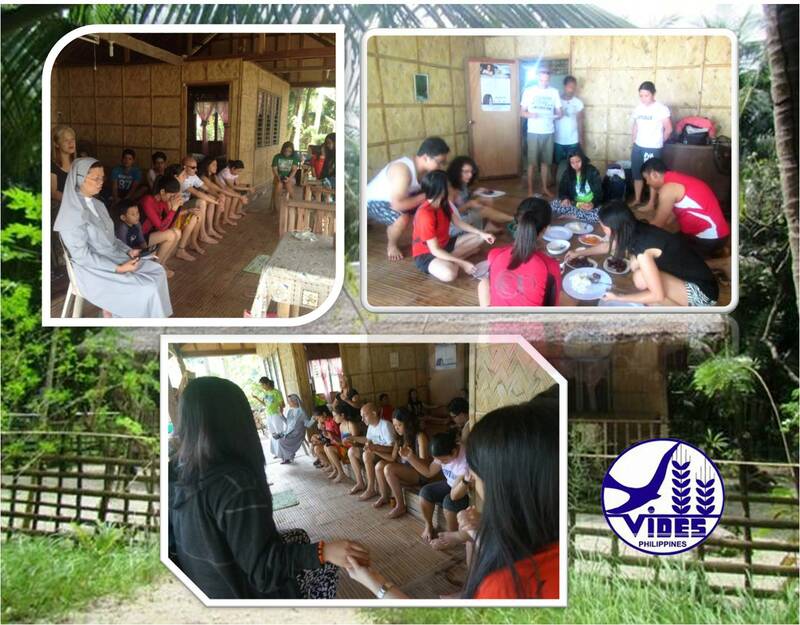 Thereafter, we shared the simple breakfast prepared by our chef-volunteers, "dulangan style". We started to travel to Calapan City just before noon because we were intending to take the 2:00 pm fast craft trip to Batangas. Unfortunately, we learned that the trips of one of the faster sea vessels were cancelled due to mechanical problems. We were not able to secure tickets for the only other fast craft available because there were too many passengers wishing to get on the same boat. We had no other choice but to take the slower Roll On, Roll Off (RORO) vessel which left mid afternoon. The volunteers passed the time away by chatting, taking photos, watching television, and napping. 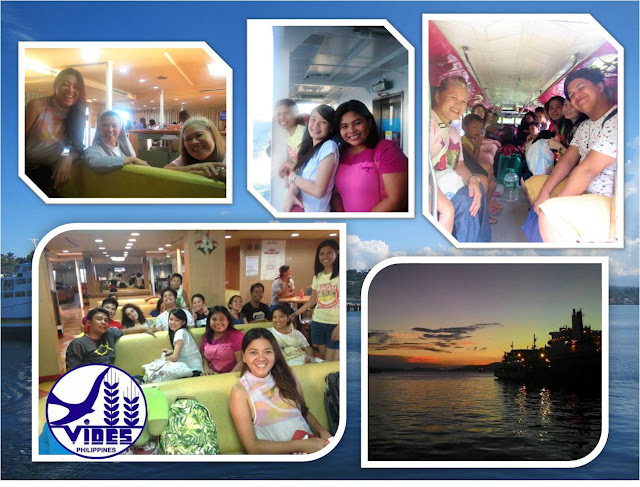 We reached Batangas Port before 6:00 pm, where we all witnessed the splendid explosion of colors as the sun set in the horizon. We immediately started our way back to Metro Manila. We aimed to catch the 8:00 pm mass at St John Bosco Parish so we just opted to order supper via a fast food's drive through facility. Fortunately, we made it to Makati just before the mass officiated by Fr. Armand Robleza, SDB commenced. We believed that it was providential that we were able to attend the Eucharistic celebration led by Fr Armand. His homily about serving, loving, offering one's self to others, and letting God's will be done was quite opportune. His message was truly spot on. 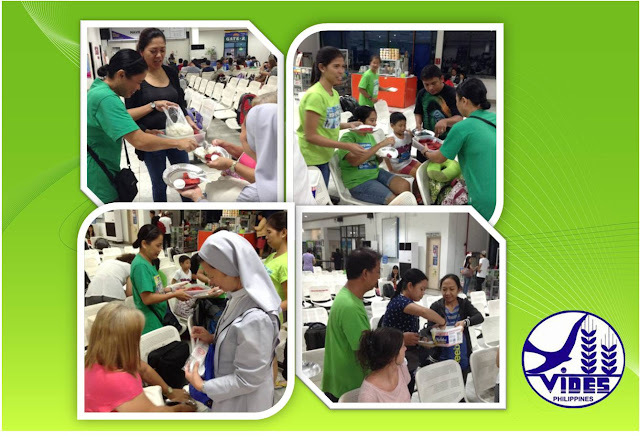 It served as an added inspiration and motivation for the volunteers to carry on with their commitment to serve and to be true to VIDES Philippines' motto and service philosophy, which is to always be "One for Others". It was certainly a weekend well-spent for VIDES Pinoy volunteers and our friends from VIDES Italy and France. This write up was penned by Ciel Estacio, a long-time VIDES volunteer and currently the organization's Board of Trustees Secretary .